Nike, Inc.’s office in Frankfurt, Germany is the headquarters for operations in Germany and Central Europe. It is part of Nike’s EMEA geography and departments include Finance, Sales, Marketing, Human Resources and Information Technology. There is also a subsidiary office in Berlin, which is home to our Converse team and part of our Sales and Marketing organization. On these pages, you can learn more about these locations and its people, and if you’re up for the challenge of finding your greatness with Nike, check out what’s available in Germany and apply now. This territory also has a large and growing retail presence, operating more than 40 retail stores in several countries, including Austria, Germany, Switzerland and Poland in locations such as Berlin, Munich, Frankfurt, Hamburg, Vienna, Salzburg, Zurich and Warsaw. "Nike was my dream company to work for and when I was offered an intern role in the finance department, I could not have been happier! Since then I’ve been a financial analyst, financial planning manager, sales planning manager and now head of sales planning. A Nike career can develop very fast. The most essential part of my role today is to lead the team; to coach, to challenge and develop people and their careers. My managers have always been a great source of inspiration to me and I’ve truly benefited from their approach to work and people. They’ve shown me how to influence and how to have impact, they’ve given me trust, responsibility and the opportunity to make decisions. This has given me a lot of self-confidence and also the opportunity to take control of my own career. The people are definitely the best thing about Nike and the culture is truly amazing. It’s a pleasure to come to work every day and meet such a talented and diverse group of colleagues. We also share more than work. For example, sport is a passion we all have! At Nike you are always challenged to develop yourself as well as your career. You need to follow your own path, be authentic and true to who you are. If you enjoy dynamic and flexible environments, this is definitely the place to be. Every day is about finding new solutions and realizing them." I’ve always had the chance to try new things at Nike. Because of this, I’ve had the opportunity to make a difference and, in my opinion, this is the best way to learn and prepare for the future. I’ve always been into sport but, for me, Nike was more than just an incredible brand - it was a forward thinking and progressive business, very dynamic and never afraid to do things differently or take risks to achieve great change. That really impressed me. After joining Nike, the culture was just as dynamic, open minded and energizing as I expected. I’m challenged on a daily basis but in a positive way, because people trust me to run with things and allow me to take responsibility. Since I always have the right support and don’t feel pressured in any way, the challenge never feels too big. I’ve also had the opportunity to work with great colleagues who also wanted to make an impact. This has resulted in us becoming a fantastic and very dynamic team. One of the main things that I love about working at Nike is that it feels like anything is possible. There is a great support network and always people to ask for help - you never have to be alone in anything. The atmosphere is great and it is refreshing to work for a business that isn’t really hierarchical. You have the opportunity when working at Nike to really explore and understand what motivates you, and to me this is one of the most important aspect of your career journey. Also, you can still do sport whenever you like! My advice to anyone who wants to join Nike is; be authentic. If there is no clear way of how to do something, create it. Have the courage to do things differently." 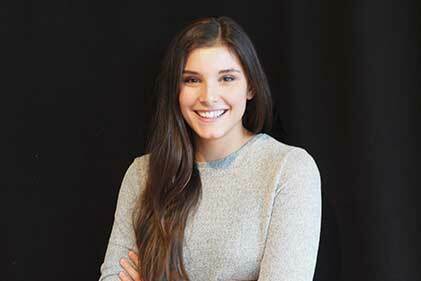 "I began with a student job with Nike Retail and I was thrilled to continue my career at Nike in the Headquarters in Frankfurt, where I joined the Finance team. I instantly knew that this is where I belonged and I felt I was part of the right team. I have a great passion for my work and I try to challenge myself every day to get better. I think it’s a part of the culture that rubs off on everyone here. I feel that I’ve learnt the true meaning of teamwork at Nike. It’s not about the individual, but the whole team and what we can achieve together. The passion for sports is evident when you work here and everyone gives their best. In the future I hope to work in the United States, which is possible with Nike"
Nike, Inc.'s competitive benefits program provides employees with the opportunity to stay fit and create a positive working environment. That is why every geography provides for variable health coverage, fitness center memberships, time off, retirement savings and more. Your particular benefits package will depend on your position and location. Here's a look at some of the benefits available for employees who work at Nike’s Germany headquaters. 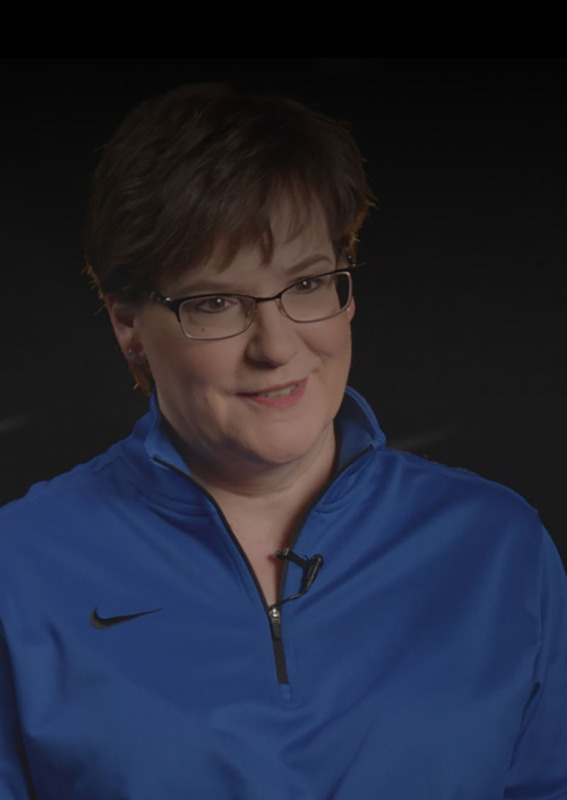 Another financial benefit is Nike’s contributions to retirement accounts. Nike partners with employees to save by providing a monthly contribution into their personal retirement savings accounts. Employees also have access to Life and Accidental Disability insurance. Nike offers a flexible daily working schedule to promote better work-life balance; each work day can start and end at variable times. A generous vacation package gives employees 30 paid vacation days per calendar year. 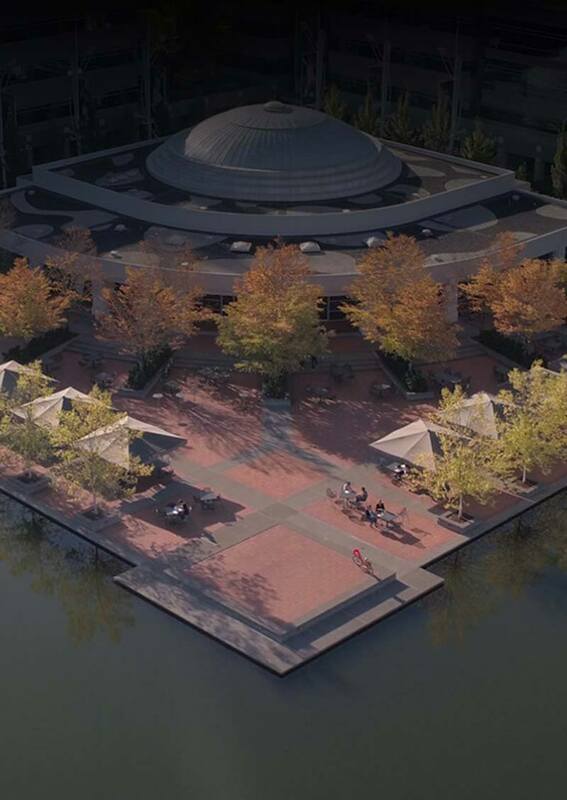 In addition, employees enjoy Nike’s summer hour schedule, which helps employees spend their summer Friday afternoons with family and friends. Nike exists to bring innovation and inspiration to all athletes – including employees. 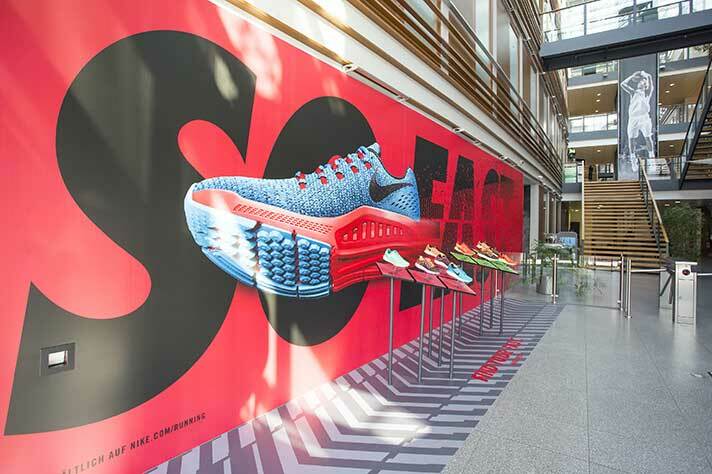 Sport is in Nike’s DNA, and its energy invigorates the Nike Germany Headquarters. The onsite sports & fitness facilities at the Frankfurt Headquarters include a gym with cardio and strength machines, free weights and kettlebells, as well as daily fitness classes, including NTC, boxing, yoga and more. Gearing up for workouts is even easier with the on-campus Nike store that stocks the latest product collections with a generous employee discount. 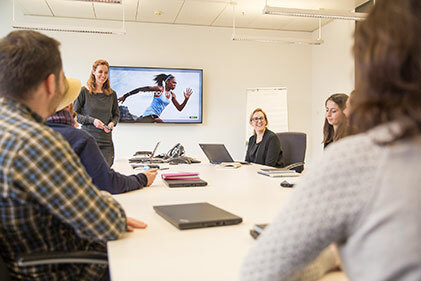 Nike, Inc.’s offices for Germany are located in Frankfurt and Berlin.Departments include Finance, Sales, Marketing, Human Resources and Information Technology.Learn more about our Germany office locations below. 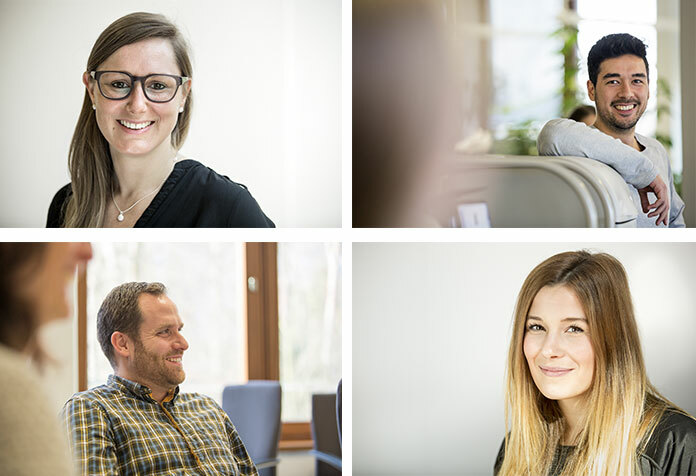 Learn more about our Germany office locations below. 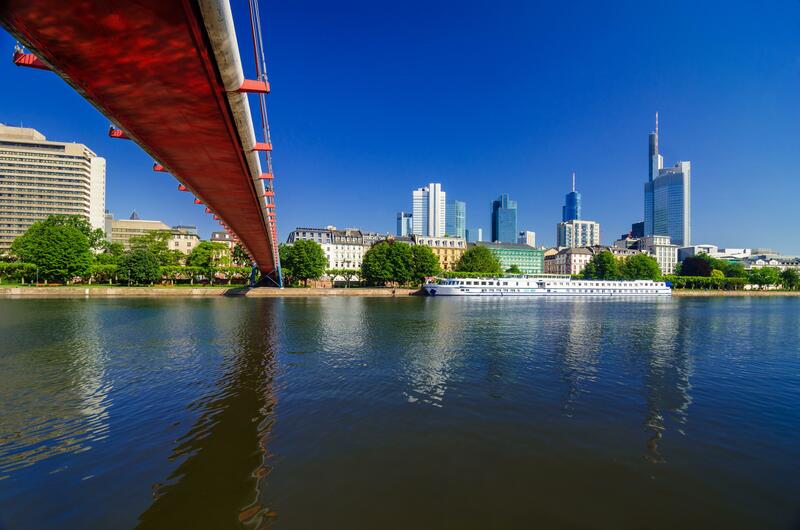 A global city, with over 2 million people in its urban area, Frankfurt am Main still offers a very unique local atmosphere. It also frequently ranks highly as a top city to live in for quality of life. Nike’s headquarters are located next to Frankfurt’s football stadium ‘Commerzbankarena’ and offers multiple workout facilities in and around the site. Departments represented at these headquarters include Finance, Sales, Marketing, Human Resources and Information Technology. Nike’s Berlin office is located in the city center west and represents mainly the marketing department. The Berlin office has two floors in the Bikini Mall, close to the famous shopping street Kurfürstendamm and only steps away from many cafes and restaurants.. We also have an excellent view over the Berlin Zoo! 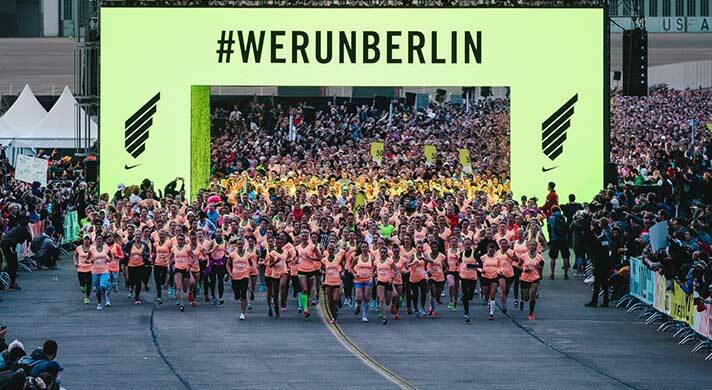 The Nike Berlin store, with our Nike Training Club studio, is also just across the street. Eating: My favorite spots are Goldener Hahn in Kreuzberg and Lavanderia Vecchia in Neukölln. Both serve high quality Italian food and great wine, with a very personal flavor. Also, always remember to bring cash when you go for dinner in Berlin since many places are a bit reluctant to credit cards. Relaxing: There are plenty of great lakes in the surroundings of Berlin. Anytime the temperature rises we drive out there with a couple of friends. Liepnitzsee has become the hotspot of the last seasons, with its great nature and water quality. Going out: Berghain was once voted the best techno club in the world and if you ask me, it’s still the place to go. Set in a former power station in Berlin, legends are built on euphoric tales of the atmosphere within, where two huge sound systems pump music of the most legendary DJ’s into a cavernous interior. Shopping: For apparel and footwear, one of my favorite shopping locations is Voo store, a lovely concept shop in Kreuzberg. Another amazing one is Andreas Murkudis on Potsdamer Strasse/Schöneberg, surrounded by loads of interesting galleries. Great places for books and magazines include Do You Read Me, Soda Books and Walter-König Books, all located in Mitte. 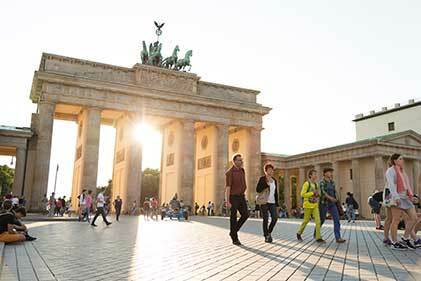 Culture: Berlin offers endless possibilities when it comes to cultural activities, from classic history museums to young galleries. My favorite places are the Neue Nationalgalerie designed by Mies van der Rohe, the Berlinische Galerie and the C/O Gallery. If you enjoy theatre make sure you visit the renowned Volksbühne. 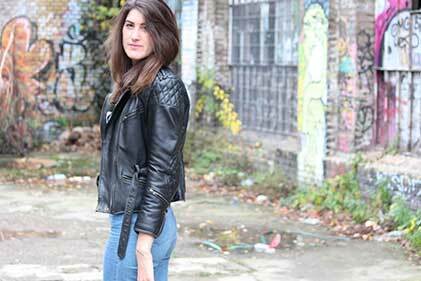 Lifestyle: Berlin felt like the most exciting place in the world for me to spend my youth. As a young city with less than 30 years of independent development, the city has opened its doors to many. In East Berlin, empty buildings that had been quietly decaying were occupied by new inhabitants. Cultural projects and artists from all over the world moved in and with a spirit of improvisation, imagination and creativity, they laid the foundation to the most diverse meeting points. In Nike’s paid internship program, students get a full immersion into the brand’s culture of curiosity and innovation. Interns interact with top company leaders, tackle complex business challenges, and build relationships and skills that endure far beyond their internship. They work on teams such as Marketing, Sales, Digital, Communications and practically every other area of the company. Nike interns not only help push forward athletic performance; they push their own boundaries in creativity, teamwork and personal growth. 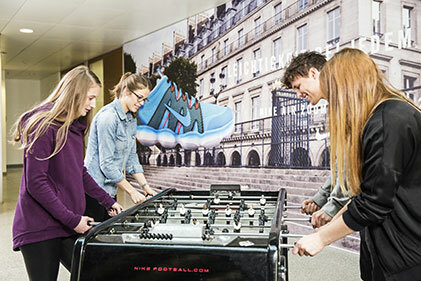 The Nike, Inc. internship program for the Austria, Germany and Switzerland territory is based at the Frankfurt headquarters. There are also a small number of internship opportunities in other office locations, such as Berlin. The internship program is open to students currently enrolled in a higher education institution (i.e., university or equivalent) or recent graduates. The internship program is a full-time job experience (38.5 hours per week). Fluency in English and German, both written and verbal, is essential. In which disciplines does Nike AGS offer internships? 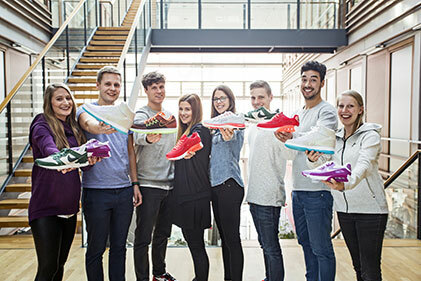 Nike AGS internships are usually 6 months long. Nike AGS offers internships throughout the year. Yes, Nike AGS also offers internships to recent graduates. Yes. All Nike AGS interns are paid a competitive salary. Each application will be reviewed against the requirements of the position and, if an applicant’s background meets the requirements, he or she will usually be contacted for a phone interview. The next step includes an interview with the hiring manager, and then Nike AGS will extend an offer to the strongest candidate for the internship. No. All Nike internships in Europe are full-time. Does Nike AGS accept international students? Yes. Any non-EU student must be legally authorized to work in Germany. All applicants should also be fluent in German. Yes. The majority of the company’s European internship opportunities are located at its European Headquarters in the Netherlands. Some of its other European offices also offer internships. Applicants can search for internship opportunities by country on Nike’s career site to find other internship opportunities in France, Italy, Russia, Spain, Turkey and the United Kingdom. 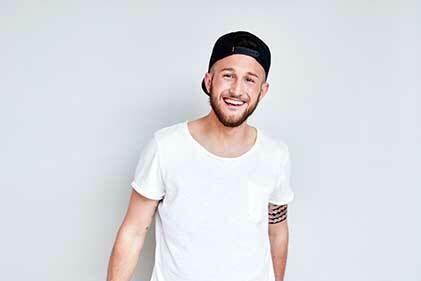 "I’ve been amazed by the people I’ve met at Nike. 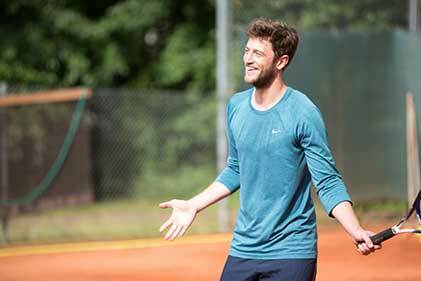 Everyone is very motivated, with such positive energy and the same connection to sport as I have. The internship has been very exciting; because we’ve been given so much responsibility and had to quickly understand the business and the work pace. It’s been such an amazing learning opportunity and the most important advice I’ve been given at Nike is to be a sponge - I think being curious and open is the most important thing here. For me, there isn’t only one best thing about working at Nike, there are many things. I love the brand, so of course this is a big part. The people are also great and I really love what I do. It’s fantastic to see what impact my work has on the rest of the business. I also love the sport programs that are offered and I use the gym a lot! To anyone thinking about applying for a job at Nike, my advice would be: go for it!" "My Nike journey kicked off with an internship. 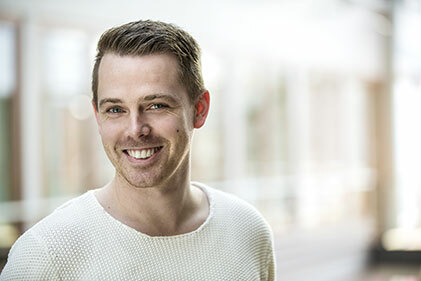 My managers were very supportive, and I was fortunate enough to try out working in different teams and functions on a few assignments across the company. It really was a huge leap into the unknown, but the support and encouragement I received from all the teams truly showed why Nike is such a great place to work. 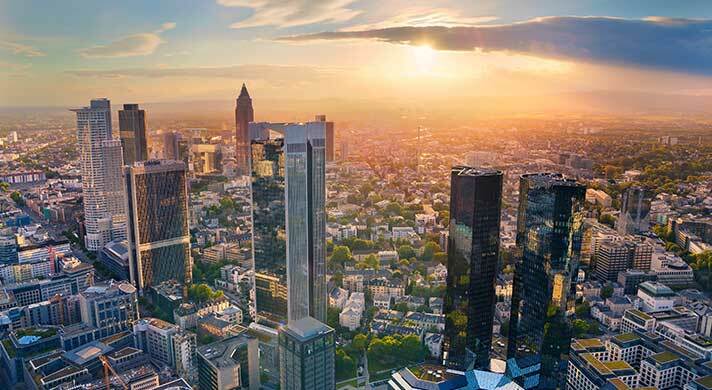 After a year in the European headquarters, I accepted a position in our Germany headquarters in Frankfurt. 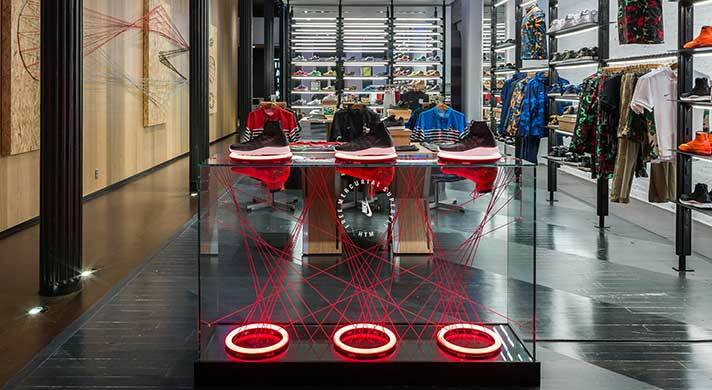 It’s hard to imagine a more dynamic and faster-paced environment than Nike. It really drives me to maximize my potential every day. Nike is an amazing place to work and I love the energy and the people. I feel truly privileged being part of this amazing team and my advice for any new hire would be to enjoy every day and never stop pushing your limits. There is no finish line." "I’ve always loved sports and have always wanted to work in a job connected to sport. 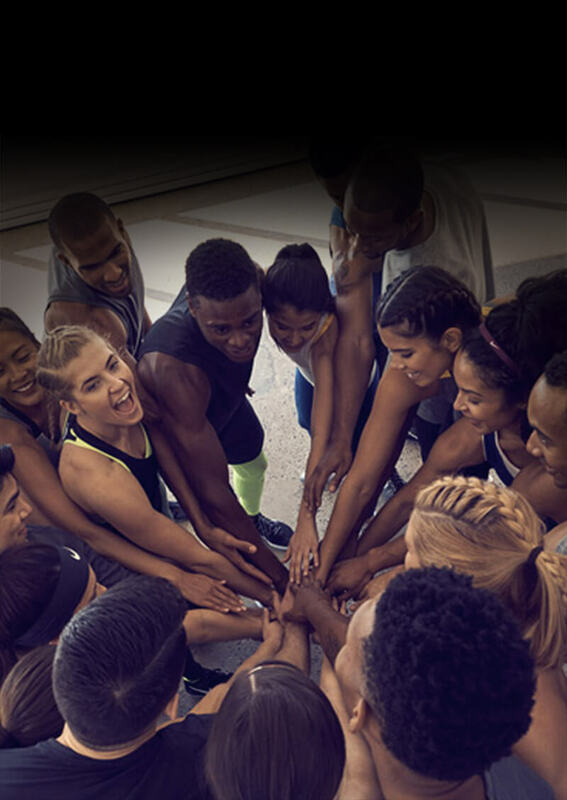 The thing I really love about Nike is working in teams with ambitious, smart and international people who all have a connection to sport. It’s amazing to see so many great people coming together and creating connections across functions. The transfer from university to work can be a bit of a challenge, but the fact that the work environment is so positive made it easy. I feel really satisfied each time a customer is happy with their Nike shopping experience. I learnt to always ask questions and to be a sponge, even if it feels uncomfortable at times. As long as you are open minded and curious, people will always take time to help you. Our office is great and the building is surrounded by several sports grounds where you can play volleyball, football or tennis, and you are also just next to a forest where you can go for a run. I love sports and I also like competition, especially when you are competing with such a great team."